A collaborative team of University of Canterbury entomologists, virologists and plant biologists has discovered new viruses in dragonflies in the Kingdom of Tonga. The UC-led research team, led by Dr Arvind Varsani (Biological Sciences), has had its research paper on a new virus species it discovered, Dragonfly cyclovirus (DfCyV), published in the June issue of The Journal of General Virology. "To our knowledge this is the first report of a circular single-stranded DNA - ssDNA - virus identified in dragonflies, and the data may help elucidate evolutionary links among novel circovirusesandcycloviruses recently identified in animals and environmental samples," Dr Varsani said. "The discovery of DfCyV establishes a precedent for circular ssDNA viruses in invertebrates." Dr Varsani's Marsden Fund supported project involves genetic diversity and recombination analysis of plant-infecting geminiviruses in the Pacific. "We were struggling to find classical geminivirus symptoms in various plants and thought that we should look at top-end predators with the help of Dr Milen Marinov, a Bulgarian dragonfly expert based at University of Canterbury. Vectors for plant viruses are predominantly insects. 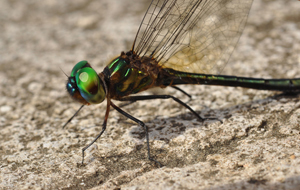 Since dragonflies eat only insects that move we collected a large sample of dragonflies, screened these for ssDNA viruses and interestingly discovered an entirely new group of viruses in them." Dr Varsani said the discovery, made using the simple top-down approach to sample viruses from the environment, gave him confidence in the effective use of top-end predators to sample viromes in various ecosystems in the future. "It changes the entire picture of how you work concentrating at the top. The top-down approach is ideal for crude sampling of a virome in this case. However, it does not provide sufficient resolution for virus-host specificity and interactions. Nonetheless, this can be investigated independently to address specific research questions that might be applied or just purely of academic interest." Papers are in production based on three other new viruses discovered in the dragonfly samples collected in Tonga. The research project has been expanded to have a more global focus with additional international collaborators coming on board. These include entomologists and ssDNA viral evolutionary biologists in South Africa (Dr Darren Martin, University of Cape Town), France (Dr Phillipe Roumagnac, CIRAD), La Reunion (Dr Pierre Lefeuvre and Dr Pascal Rousse, CIRAD), and a North American team comprising Dr Mya Breibart, Dr Karyna Rosario (University of South Florida, USA) and Dr Jessica Ware (Rutgers University, USA) all exploring the "depth of virus diversity in dragonflies", Dr Varsani said. "We will explore the diversity and evolution through recombination of these single-stranded viruses. Our long-term goals include using virus 'signatures' to date and plot global movement and trafficking of host species."